Last night we had an awesome healthy wild salmon dinner. I must admit salmon hasn’t always been my favourite piece of fish to cook or eat, but, I know how good and healthy it is for me so I keep cooking and eating it. Last night I surprised myself. I was playing around with the spices and oils in my cupboard and I finally NAILED it! I made the best salmon dinner ever so I thought I would share it with you. We had just about a pound of wild salmon to feed 2. Note: I started buying my salmon wild because it is more nutritious, contains fewer toxins and generally tastes better! 1.5 Tblsp Pasolivo Lemon Olive Oil – I picked this up in Paso Robles California on my latest visit – Try them out! 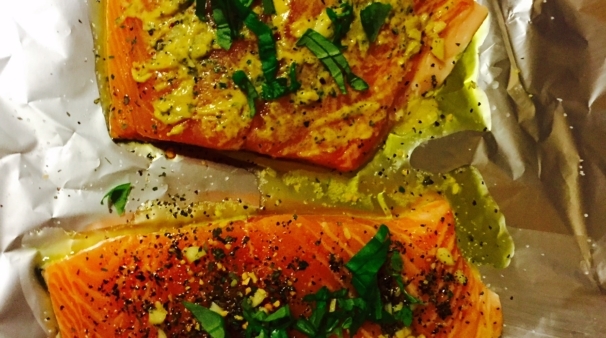 I lay the healthy salmon on a piece of aluminum, drizzled the olive oil, sprinkled on the spices and then covered the salmon with the rest of the aluminum. I put it in the oven on bake for 35 minutes at 375 degrees and it turned out perfect!! Try this healthy recipe today!